In a shallow bowl, combine the flour with salt, paprika, garlic powder, dried oregano, and black pepper. In a separate bowl, beat the eggs with the water. 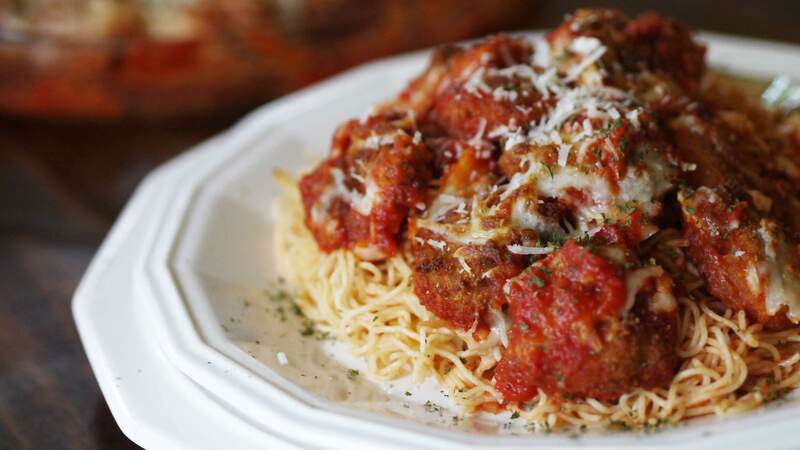 In another bowl, combine the bread crumbs with the Parmigiana. In a medium pot, add vegetable oil and heat the oil to 360 degrees F. Use a thermometer to gauge the temperature. Preheat the oven to broil. Cook pasta according to package directions, al dente. Meanwhile, one at a time, dredge the shrimp first in the flour, then in the egg wash, and then in the bread crumbs, tossing to coat evening and shaking to remove any excess. Place on a plate until ready to cook. Add the shrimp in batches to the hot oil, turning occasionally, and cook until golden brown and the shrimp float to the top, about 2 minutes. Remove the shrimp with a slotted spoon and drain on paper towels. Transfer the shrimp to a baking dish. Spoon 1 3/4 cups of the marinara sauce over the shrimp and sprinkle the mozzarella over the top. Place in the oven and broil until the cheese is melted and bubbly, about 3 minutes. Meanwhile, toss the prepared spaghetti with the remaining marinara sauce. To serve, spoon the spaghetti into a large serving bowl and using a spatula, transfer the shrimp to the top. Garnish with chopped parsley and serve immediately.